About 8.00, you are picked up at hotel and start a 170km drive through rural northern Vietnam to the site of Vietnam\’s first capital – Hoa Lu, to visit Bai Dinh Pagoda which will become the largest religious tourist center in Viet Nam upon completion in 2010 to celebrate the 1,000th anniversary of Thang Long – Ha Noi. Lunch is served in local restaurant. After breakfast, drive to Halong. About 11.30-12.00, you are welcomed on boat and have set lunch while cruising in the bay. Depends on which cruise you choose, the detailed itinerary will basically include visit Amazing cave, kayaking (extra option), swimming in crystal water and enjoy the landscape. Dinner and overnight on the cruise. Breakfast on boat. Some boat has option of Tai Chi exercise in the morning. 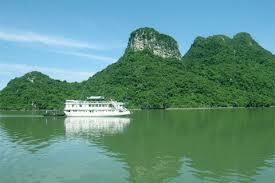 While cruising back to Halong City, you will check out at about 10.00 and have lunch before getting off the boat. Our driver is waiting for you to transfer back to Hanoi at about 4pm. What to bring: Passport, Sun glasses and hat, toiletries, sunblock, insect repellent, flashlights, good hiking shoes, personal firs aid kid and medicines, small VND notes for buying drinks.